Commissions are now open again! Please look over the information provided and let me know if you have any questions! Last edited by MisterFinch on Mon Apr 15, 2019 9:28 pm, edited 5 times in total. You might want to put picture examples next to each price range so that people who are casually scrolling can stop by and be intriqued - not very amny people click through links unless they recogognize the username. Re: Mister Finch is Open for Commissions! Re: Mister Finch is Back for Commissions! I'm extending the time period of the sale. I work full time and that's been a lot of strain on my time. Also I will be adding this forewarning: Since I do work full time, it will take me a while to finish commissions. I only ask that everyone is patient as I can occasionally end up stressed depending on the situation. In return I will make sure your commissions are finished as soon as possible. I'm making commissions open to those who already commissioned now! I'm staying at 5 slots, but as usual, when one opens, I'll notify everyone! Feel free to ask questions before commissioning. Note that because I work 9 hours a day during the Weekdays, I will be slow on working on the commissions. Please be patient and thank you for your cooperation! A Sequence will be from up to down on one single image and will be full color. As of right now, I have several commissions I am finishing up, but once the queue is complete, I will be opening up for new commissions. Still first come first served. I will update once the queue is open. There is one commission still waiting on more information, but it won't take up one of the 10 new slots. It will take priority though. I'm currently working on two projects (The sketches I posted two days ago), but I'm planning on opening commissions again. It will be 5 slots only, one per person. If you're interested, hit me up and I'll add you to the queue. Please see my commission information for things I will not draw. I will work on an official commission pricing post later in the week. Please look at my commission information for the current pricing. 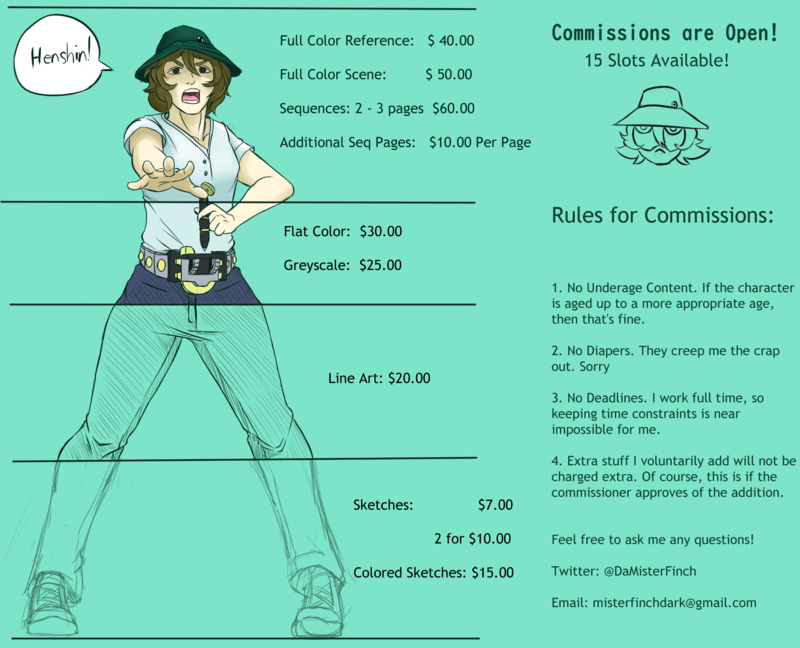 I updated my pricing info and commission information. Next update will be after the slots are all full.